I realized the other day that I categorize cooking in a few different ways in my head. There’s the day-to-day cooking that can be done on autopilot. And, there’s cooking from a recipe when I just need to check quantities but otherwise pretty much know what to do when. Then, there’s the exciting stuff that makes me think “now I’m really cooking.” Making sauces falls squarely in that last category. I received a review copy of Modern Sauces by Martha Holmberg, and I can’t seem to put it down. The instructions throughout the book take the fear out of making serious sauces. There are helpful tips, suggestions of what to look for as the sauce cooks, and ways to rescue a sauce that isn’t turning out quite right. The chapters are organized by type of sauce, and those include Vinaigrettes, Herb Sauces, Tomato Sauces, Vegetable Chile and Nut Sauces, Butter Sauces, Cream Sauces, Mayonnaise Sauces, Hollandaise Sauces, Gravy Jus and Pan Sauces, Sabayon Sauces, Custard Sauces, Fruit Sauces, Caramel Sauces, and Chocolate Sauces. There are recipes for several versions of each type of sauce which are followed by recipes for dishes incorporating those sauces. I’ve already made several things from the book, and there’s so much more I can’t wait to try. I want to drizzle the Honey-Ginger-Tangerine Sabayon over fresh strawberries, and I want to add the Fresh Orange-Smoked Paprika Vinaigrette to an arugula salad with grilled shrimp. I already made the Braised Vegetables in Charmoula and the Jalapeno-Lime-Ginger Butter Sauce with stir-fried vegetables. It’s amazing how just a small bit of sauce with big, bright flavors can change a dish. After reading the Chocolate Sauces chapter, I declared that I needed to try each and every version. So far, I’ve only gotten to the Mexican-Style Chocolate Sauce, and I’ll tell you more about that soon. First, I have to mention this lovely spin on a classic which is Saffron-Red Pepper Hollandaise. Classic Hollandaise is a beautiful thing, and adding the flavor and color from roasted red peppers, orange juice, and saffron took it to another level. 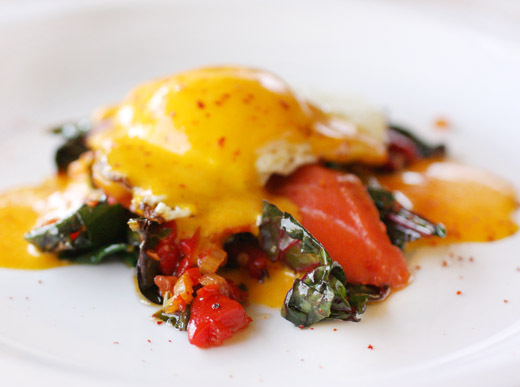 In the book, the sauce is included in an eggs Benedict kind of dish made with sauteed Swiss chard and a fried egg stacked on toasted foccacia. I changed it up just slightly by leaving out the bread and adding a couple of slices of smoked salmon below the egg. Making the sauce requires a couple of easy steps to get everything prepped and ready for the final whisking action. Butter was melted and left to sit so the milk solids could fall to the bottom of the pan. Meanwhile, roasted red peppers were pureed with olive oil. I used a food processor which didn’t result in a perfectly smooth puree, so I strained the mixture and set it aside. Then, you’ll want to have your eggs separated and some orange zest ready. In a heat-proof bowl set over a saucepan with water, you start by warming orange juice with saffron threads. The egg yolks were added next and whisked into the juice. By whisking as the yolks slowly cook, they start to thicken. The recipe includes clear information on what to look for and how long each step should take. Once the yolks were just thick enough, the melted butter was slowly added off the heat while still whisking and the milk solids were left in the bottom of the pan. Last, pepper puree, orange zest, and hot sauce if desired were added, and the sauce was tasted for seasoning. The sauce can be kept warm in the top of a double-boiler while frying the eggs and making the rest of the dish. I loved everything about this sauce from making it, to its pretty orange color, to its decadent, orange and saffron flavor. I’m not quite ready to make Hollandaise on autopilot, but I’ll definitely be making it again soon unless I get completely distracted by the Caramel chapter first. I have a feeling this book is going to be spattered and stained from lots of use. Recipes reprinted with publisher’s permission from Modern Sauces . I doubt if any Provencal cook has ever made this version of hollandaise, but I liked the way the flavors in it conjured up a south-of-France feeling as I made it, so I’m projecting a Provencal connection here. Use a nice, fruity extra-virgin olive oil to extend the Mediterranean note.This sauce begs to be served with seafood, especially hot and sizzling from the grill, and it’s crazy good on a gutsier version of eggs Florentine. Jarred Spanish piquillo peppers are excellent in this sauce. You’ll need about three peppers. Or, you can use regular jarred roasted red peppers, in which case one medium pepper should be sufficient. And, of course, you can roast and peel a fresh pepper. In a small saucepan, melt the butter over medium heat. Don’t stir as it melts. You want the milky solids to fall to the bottom and the butterfat to float to the top. Keep warm. In a food processor, combine the red peppers and olive oil and process until a smooth puree forms. You want to emulsify the oil with the peppers; the mixture should look creamy and combined. Pour water to a depth of 1 to 2 in/2.5 to 5 cm into a medium saucepan and place over medium heat. Rest a medium stainless-steel bowl in the pan over (not touching) the water. Put the orange juice, water, ¼ tsp salt, and saffron into the bowl and let sit over the heat for a few minutes so the saffron infuses the liquid. When you can smell the saffron, add the egg yolks and start whisking. As the bowl heats up, the yolks will begin to thicken. Whisk vigorously, scraping around the bowl with a heat-resistant rubber spatula from time to time so that bits of yolk don’t get stuck and overcook. Beat until thick and frothy but not quite fluffy, 3 to 4 minutes. The whisk will start leaving a clear space on the bottom of the bowl. Remove the bowl from the heat and whisk for another 30 seconds or so to stabilize the sauce and let the bowl cool down. Continue whisking as you slowly drizzle in the warm melted butter, taking care not to add too much of the milky-watery layer from the bottom of the pan. As you pour and whisk, make sure the yolks are accepting the butter and the yolks and butter are emulsifying. If the sauce looks at all broken or “curdly,” stop adding butter and just whisk for a few seconds. Only resume adding butter once you’ve whisked the sauce into creaminess again. Once all of the butter has been added, whisk in the pepper puree, the orange zest, and hot-pepper sauce. Taste and adjust the seasoning with salt, hot-pepper sauce, and orange juice if needed. If possible, serve right away. Note: For my version, I skipped the toasted bread and added slices of smoked salmon before topping with a fried egg. I also never bother to boil chard before sauteing. Here is another recipe created by my friend Matthew Card. It’s a riff on eggs Florentine (eggs Benedict but with spinach instead of Canadian bacon or ham) and, like every dish he makes, it is turbocharged with flavor. It would also be delicious with any of the other sauces in this chapter, so feel free to experiment. Avoid using a hard-crusted bread here. If you can’t find focaccia, substitute something tender and flavorful, such as brioche or a soft Italian loaf. Peppadew peppers, which originated in South Africa, are sweet, tangy, and only modestly hot. They are pickled and sold in jars in the deli section of well-stocked grocery stores. Bring a large pot of salted water to a boil. Add the chard leaves (not the stems) and cook, stirring occasionally, until just tender, 3 to 5 minutes. Drain, rinse well with cold water, and squeeze out as much excess water as possible. Chop coarsely and set aside. In a large frying pan over medium-high heat, heat 3 tbsp of the olive oil over medium-high heat. Add the chard stems and a large pinch of salt and cook, stirring occasionally, until tender and lightly browned, 6 to 9 minutes. Add the garlic and Espelette pepper and cook, stirring, until very fragrant, about 30 seconds. Stir in the cooked chard leaves, roasted pepper, and Peppadew pepper. Cook, stirring often, until the flavors are blended and the chard is hot, about 2 minutes. Transfer to a medium bowl and cover to keep warm. Do not rinse the pan. Break each egg into a small teacup. Return the frying pan to low heat and add the remaining 1 tbsp oil. Carefully slide the eggs from the teacups into the pan so they stay whole. Season them with salt, cover the pan, and cook until the eggs are just set, 2 to 3 minutes. Place a piece of focaccia on each plate, divide the chard mixture evenly among the focaccia, top with an egg, and then spoon a generous blanket of the warm hollandaise over the top. Serve right away. A beautiful combination and recipe! Thanks for the info about Modern Sauces, Lisa. Have not heard about it. Must be a gem of a cookbook. My mother made a fabulous Hollandaise and I always use her recipe, but think I will add a few touches the next time. This looks marvelous! Really like the chard and salmon additions....skip the bread as far as I'm concerned. Gorgeous pics! I made a hollandaise sauce at home once - I wasn't that impressed. I think I'll have to try it again! I like all the flavors you added to this. And the colors - so pretty!! Not really a fan of Hollandaise, but this one with saffron sounds and looks wonderful that I might give it a try too. LOVE the addition of saffron! Brilliant! I definitely know what you mean about different types of cooking...and the feeling when you're really getting your hands dirty and doing it is the best! This hollandaise is so inventive. I love it. Never had or made hollandaise sauce before! Sounds like a great combination of flavors and it's an amazing touch on kale and fried egg! Barbara over at Moveable Feasts said we were on the same sauce wavelength on our blogs. I've been doing a sauce series --- but using the really old school sauces and recipes. One of my favorites on that front is the decades old book, Saucier's Apprentice. You might get a kick a kick out it. Love your dish .. everyone has their own secret to perfect hollandaise every time (I use chunks of cold butter, stirred very fast). Thanks so much for sharing the colorful recipe with us Lisa...I love it. I'm charmed by the spectacular photo with the sunny hollandaise sauce! A spectacular post Lisa! I think the last time I made hollandaise was 20 years ago! Love this version, it sounds a lot more flavorful than jusr rich and creamy! This looks incredible Lisa. I agree about Hollandaise. It's incredible when you get it just right. The saffron adds such a beautiful color. I wish I had this for breakfast this morning. Lovely recipes! I love making Hollandaise sauce - all that butter and lemon. Wonderful flavor. Never tried it with saffron though - terrific idea. And Hollandaise is made to combine with eggs, IMO - great way to dress them up. Good stuff - thanks. Yes, a stellar sauce can turn an ordinary dish into something spectacular! 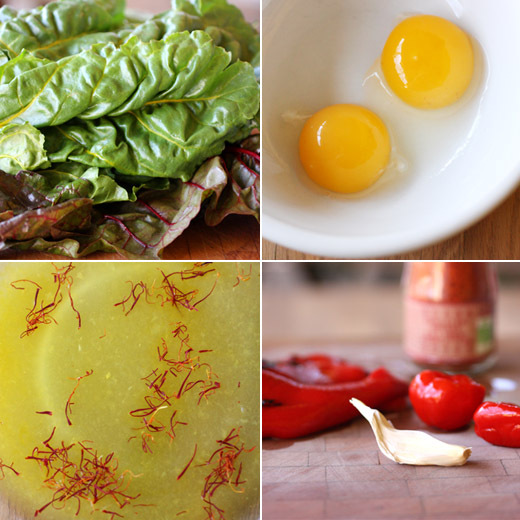 Your saffron-red pepper hollandaise is definitely one ot them! Lisa, can I please come over for breakfast this morning? 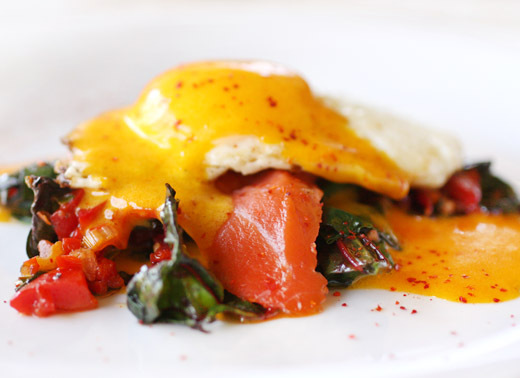 I am an egg fanatic and love hollandaise - the additions of red pepper saffron and chard look like heaven. And a book all about sauces sounds totally inspiring. Wow is this an impressive brunch. The color in this dish is amazing. I love hollandaise so I would love to try this, great idea.